Last week we’ve shown your our awesome road trip through Europe. This week we will show you one of our other favourite journeys: our road trip through the USA. This road trip took about 3,5 weeks, even though we would have loved to have much more time! Check out our roadtrip USA travel map. Our trip started in San Francisco. 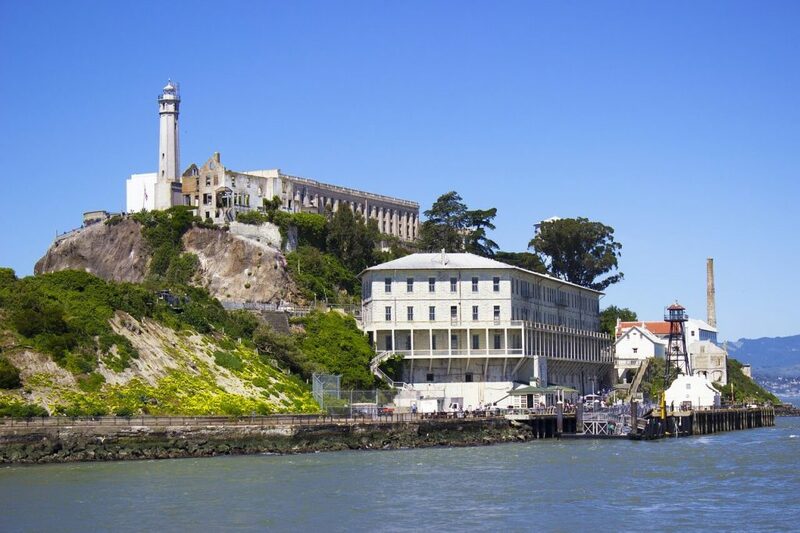 We hired a small camper and visited icon landmarks such as Alcatraz, the Golden Gate Bridge and Pier 39. We love the city for its rich cultural diversity and amazing food! Make sure you’re visiting Palo Alto if you’re a tech junky like us. After spending a bit of time in the big city, it’s time to go back to nature. 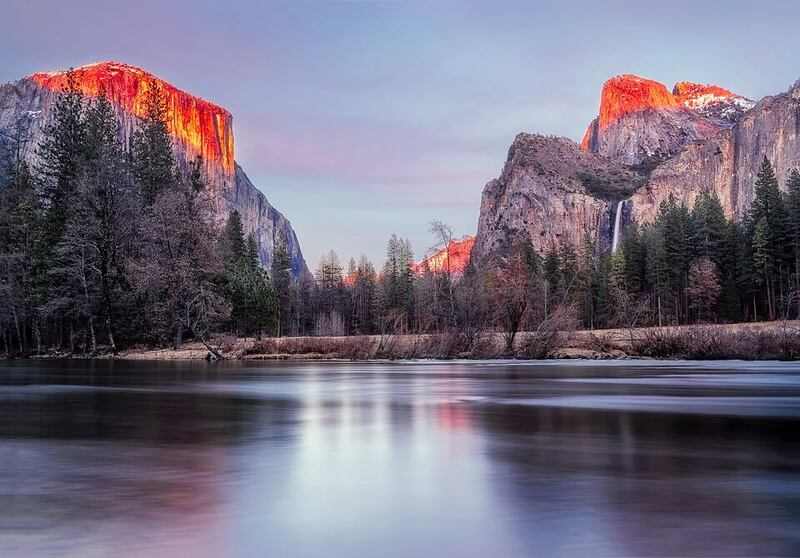 You will find one of the most famous national parks in the world within 5 hours of San Francisco, Yosemite National Park. Go up to the tunnel view lookout Point and enjoy the spectacular view over Yosemite Valley. We also did the mist trail, which leads to a nice view of the Vernall fall. 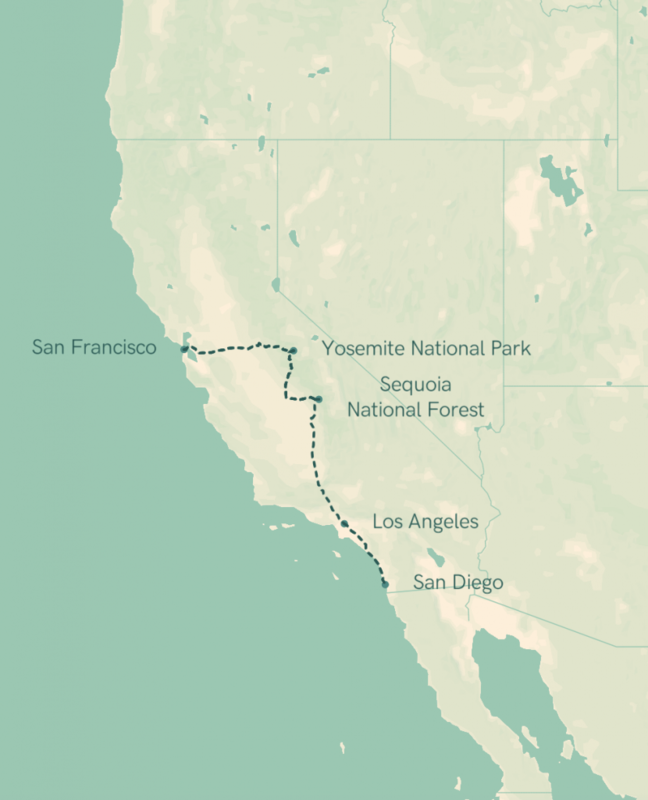 And we’re on to the next national park, Sequoia National Forest. It’s famous for one thing, tree’s, very big trees. 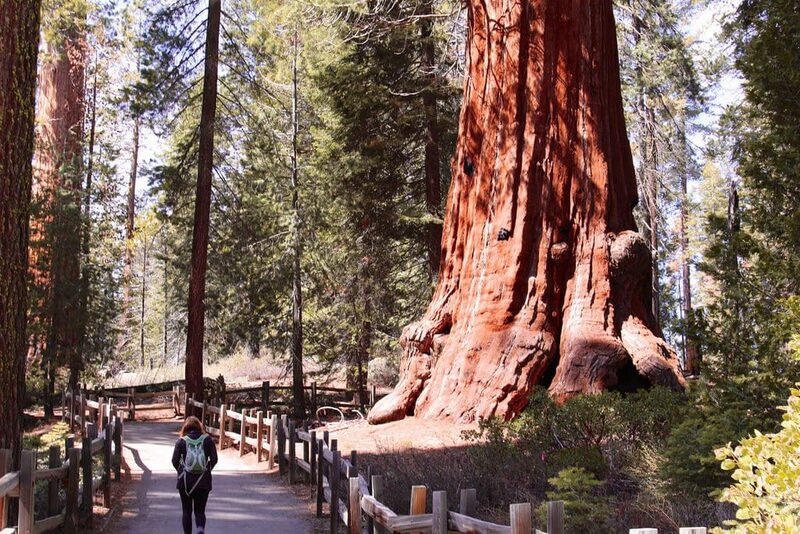 The sequoia trees are absolute units and are a delight to see. 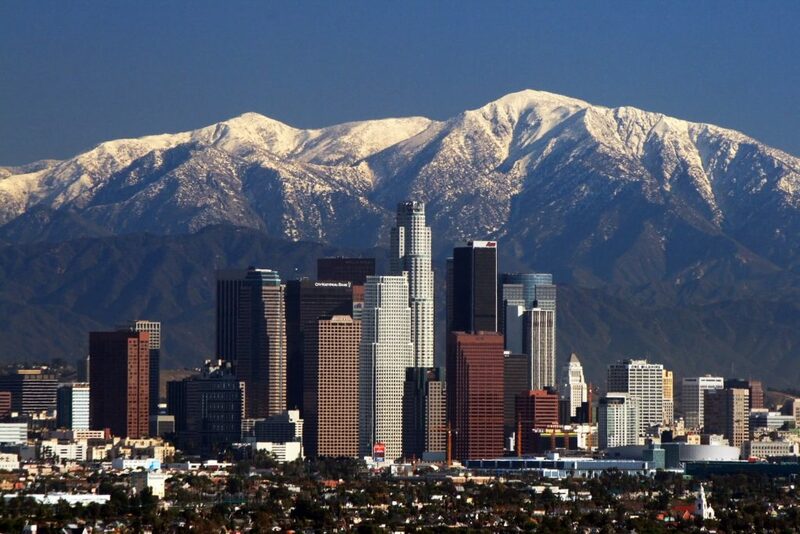 A 5-hour drive from San Francisco (avoid peak traffic) you’ll the city where all the big movies and TV shows are coming from, Los Angeles. We stayed in LA for three days and went to the Walk of Fame, the Santa Monica Pier and the Hollywood Sign (which was a bit disappointing and quite hidden). Unfortunately, we didn’t have enough time, but we heard great things about Universal Studios and Disneyland. We ended our road trip in San Diego, which is about an hour drive from Sequoia National Forrest. 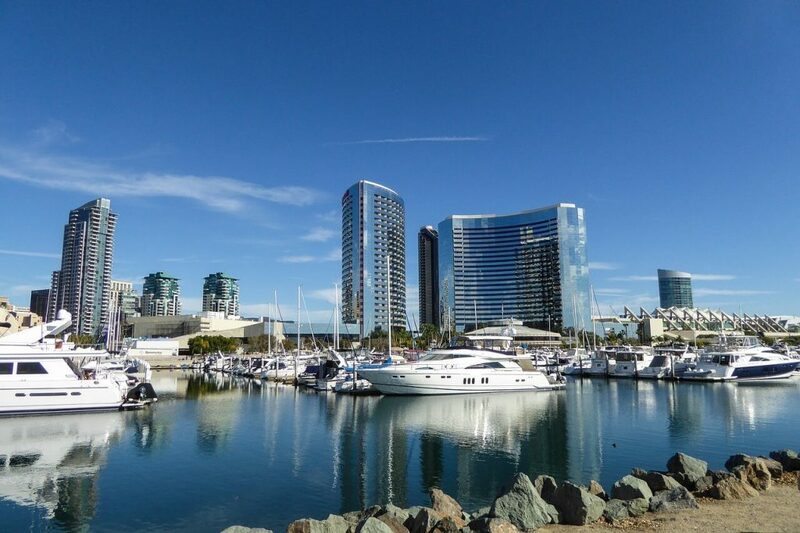 Since this was our last stop, we took it a bit easy and visited the beaches and Sea World, San Diego. Balboa Park, a big city park, is also worth a visit! The west coast is spectacular and we really enjoyed our West Coast USA road trip and have framed the poster in our hallway. What kind of US road trip did you make? Create a poster of it and save it forever!